One of the delights of being a parent is watching your child grow and develop. Some parents keep a development book handy to make sure their child is reaching all the milestones within the prescribed time-frame, and delight with each new development. Parents wait for their child to start smiling, talking, sitting up, crawling and walking with bated breath, eagerly looking forward to the next phase of their little one’s development. As you watch your bundle of joy grow, you may be interested in knowing how to determine whether your child is left-handed or right-handed. Some people may feel that it doesn’t matter, but for lefties, life can be a little more challenging if some adjustments aren’t made, and for parents of lefties, making those adjustments early can help your child in a variety of situations. Scientifically, hand dominance or handedness is explained as the hand that is most used in performing tasks or the hand that is the most nimble and rapid in performance. Among researchers and scientists, hand dominance is seen as a continuum between strong right and strong left. The four types of handedness are: right-handedness, left-handedness, mixed-handedness and ambidexterity. By far, the vast majority of the population is right-handed. Left-handedness is less common. Someone who changes hand preferences when doing a variety of tasks is considered mixed-handed or ambidextrous. About 30% of the population displays this trait. Ambidexterity is relatively rare, but can be learned. Those who learn to be ambidextrous have a tendency to favor their naturally dominant hand, while those born with the ability are equally adept at doing things with either hand. It is interesting to note that in identical twins there is often a difference in the handedness of the two, with one being left-handed and the other being right handed. Rik Smit explores this phenomenon in his book, The Puzzle of Left-Handedness. Australian researchers supposedly debunked the idea of the vanishing twin theory, which held that left-handers were part of an identical twin pair in which the right-handed twin fetus failed to develop, however, Smit re-visits this idea heavily in his research. For the most part, babies start off using both hands to do things and preference for one hand or the other seldom manifests before seven to nine months of age. Even then, the preference may not necessarily be permanent. Usually around two years of age there is steady use of one hand in particular, but some four- to six-year-olds may still be ambivalent regarding a dominant hand. Often, parents will assume that the hand with which the child catches or throws a ball is the dominant hand, but that isn’t always the case. More accurate indicators include observation of which hand the child uses to reach for items that are placed directly in front of him, or the hand she uses to feed herself. If she stirs things counter-clockwise, she is most likely left-handed. Which hand does he use for grooming? These everyday tasks are more accurate in predicting the handedness of your child. Genetics plays a part in handedness as well. 10% of the population is left handed, and twice as many males as females are lefties. If both parents have a dominant left hand, there’s a 25% to 50% chance your child will be a leftie. Trying to change your child’s dominant hand may lead to frustration since it is a trait determined by genetics and the brain, and is not recommended despite the prevalence of the practice in generations past. 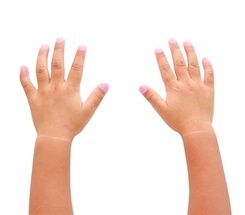 Since handedness is influenced by the brain, you should be aware that babies who show an exclusive hand dominance before the age of 18 months might have a motor development problem. Children who have had injuries to the right side of the brain may show a preference for using the left hand, so preference for the right hand could signal injury to the left side of the brain that’s previously gone undetected. Any concerns should be addressed with your pediatrician. While most scientists believe that there is no difference in intelligence between left-handed or right-handed people, Chris McManus, author of Right-Hand, Left-Hand believes that the left-handed population is growing, and that throughout history this population has produced a proportionately greater level of high-achievers. Researchers from Johns Hopkins University and Lafayette College found that among those who had post-secondary education, left-handers earned 10% to 15% more than their right-handed contemporaries with the same level of education. They also found that regarding the general population, however, there is no significant difference in income between the two.